Camshafts, valves, screws, pistons, biomedical implants or electrical spindles. Whatever your need with measuring turned, ground and cylindrical components, we deliver solutions without fail – and this December we’re inviting you to let us prove it. VICIVISION UK is part of the Carfulan Group, which is preparing to host the inaugural Manufacturing Performance Network (MPN) event at its headquarters near Derby. For the very first time, the group’s five companies will bring together their extensive range of complementary manufacturing technologies under one roof. As the leading supplier of optical, non-contact inspection machines and quality control systems across the UK and Ireland, VICIVISION UK increases production efficiency through a combination of advanced hardware and intuitive software. By using superior high-resolution video camera technology to carry out a number of precision checks on a single set-up, there is no need for multiple specific instruments such as co-ordinate measuring machines or handheld gauges. Even the most complex parts can be inspected on the shop floor in a matter of seconds, down to the last minute detail. No human error, no unnecessary transportation of parts and increased flexibility. Achieving smarter and more reliable processes, delivered with speed and efficiency regardless of the complexity of a part, means reduced rejection rates, minimal rework and therefore immediate time and cost savings. When a business can guarantee a repeatable supply of quality products, first time and every time, their reputation will soar. With increased product throughput comes increased capacity, allowing manufacturers to take on more work with the confidence that demand will be met. 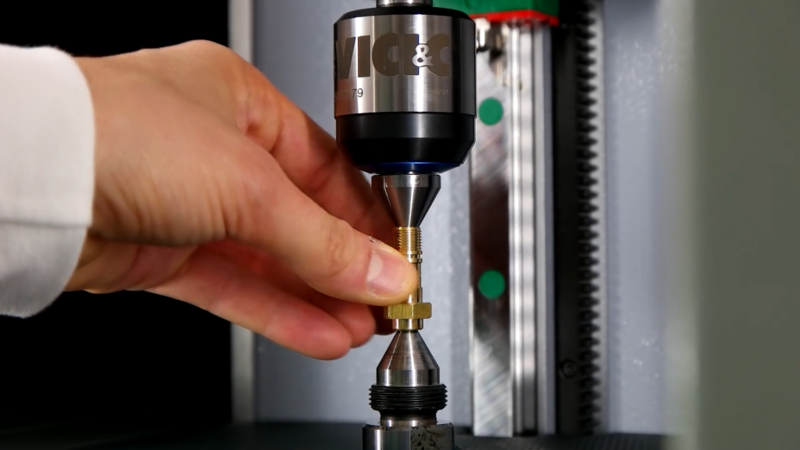 If shaft measurement is a crucial part of your business, bring along some of your own sample parts to MPN and our engineers will demonstrate the advantages of VICIVISION technology to you. M306 and M618 – these machines, from VICIVISION’s renowned Techno series, are compact and ergonomic, offering benchmark reliability and immediate data capture. Thanks to wide measuring fields (600x180mm on the M618), impressive load capacities (up to 30kg on the M618), high-resolution capabilities and intuitive software, each part produced by a CNC lathe can be inspected on the production floor, with fast and efficient batch changing leading to greater productivity. Metrios – At the press of a button and touch of a crystal-clear screen, this state-of-the-art, automatic 2D digital optical measuring machine performs accurate and objective part-quality tests directly on the shop floor, increasing productivity and reducing costs. Complex measurements such as distances, angles, radii, diameters and roundness can be taken in just seconds, all with a simple and intuitive click. It’s been designed to measure anything from metal components to deformable materials with ultimate consistency, using in-house software developed to meet each individual user’s requirements. Alongside VICIVISION UK, the Carfulan Group is made up of OGP UK, SYS Systems, ZOLLER UK and XJ3D. Its unique business model allows it to work with leading UK manufacturers in multi-sensor metrology, turned-part measurement, additive manufacturing and tool pre-setting and inspection, unleashing their potential for improved business processes and end-product excellence. Best-in-class technology from across the companies will be on show throughout the MPN. Among them will be an XJet machine, which employs ground-breaking NanoParticle Jetting™ (NPJ) technology capable of 3D-printing geometrically complex ceramic and metal components quickly, safely and with unmatched quality. It will be a UK technology exclusive after XJ3D – the Carfulan Group’s newest business – became the first appointed worldwide partner of Israel-based XJet.